Two years after Benghazi, “deficiencies” found in Tripoli emergency plan. Less than two years after the security debacle of Benghazi, the State Department apparently botched some aspect of the dramatic, ultimately successful operation to get its diplomats out of Tripoli, Libya amid civil unrest last year, but the department refuses to say what went wrong. The purported mistake was referenced in an unclassified summary of an urgent State Department Office of Inspector General alert posted online in late July. An official with the State Department’s Bureau of Diplomatic Security declined to explain further, telling ABC News that OIG’s full report is classified and is being reviewed. A representative for the OIG declined to comment. The State Department’s security operations in Libya have been under a microscope ever since the deadly 2012 attack on a diplomatic facility in Benghazi in eastern Libya that claimed the lives of then-U.S. Ambassador Christopher Stevens, State Department technical specialist Sean Smith and CIA contractors Glen Doherty and Tyrone Woods. A State Department internal investigation of that incident found there was a “systematic failure” by the department to address the security needs of the Benghazi facility. A year and 10 months later, the July 2014 Tripoli evacuation was prompted by “freewheeling militia violence” that presented a “very real risk to our personnel,” Secretary of State John Kerry said at the time. 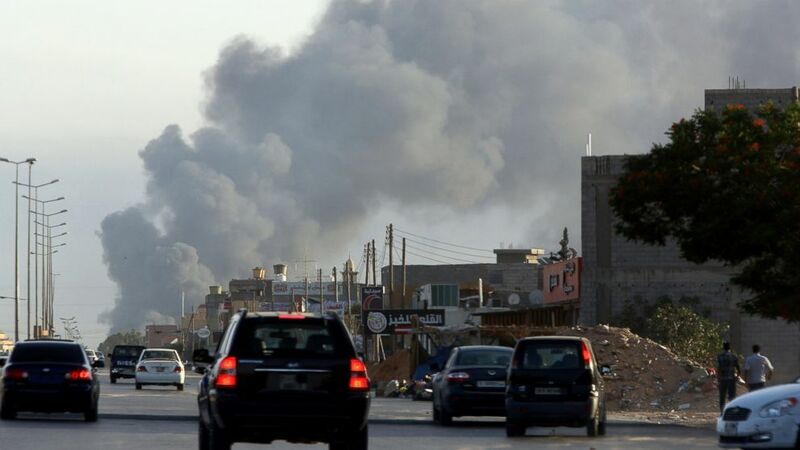 Militias were battling, in part, over Tripoli’s international airport not far from the embassy. (MAHMUD TURKIA/AFP/Getty Images) Smoke billows from an area near Tripoli's international airport as fighting between rival factions around the capital's airport continues on July 24, 2014. The convoy of more than 150 people withdrew at dawn, attempting to keep a low profile in a caravan of armored vehicles, to make a 250-mile overland trip to Tunisia. The U.S. military provided airborne security for the convoy with two nearby F-16s, high-altitude surveillance platforms and two MV-22 Ospreys filled with additional Marines. The Marine Corps officer who led the crisis response group in the region, Col. Kenneth Detreux, told The Washington Post last September that he initially disagreed with the plan to evacuate overland, preferring to be airlifted out. The white-knuckle evacuation was deemed a success afterwards, but the OIG report is the first to publicly raise questions about State’s actions. ABC News attempted to speak with Col. Detreux about the evacuation, but a Marine Corps spokesperson indicated the Department of State had interceded and said Detreux would "not provide any additional comment." Ambassador Jones was also not made available for comment on this report. Initially, the State Department said it expected to return to Tripoli shortly after the evacuation, but in another OIG report posted in May, Ambassador Jones was quoted as saying the U.S. likely won’t “begin to consider such a return” until 2016 at best.